Do you have a picky eater at your house? Do you fight to get them to eat fruits and veggies? I have a picky-cringes-at-the-sight-of-veggies-eater so I feel your pain. Well I have a couple of mommy \brilliant solutions for you. 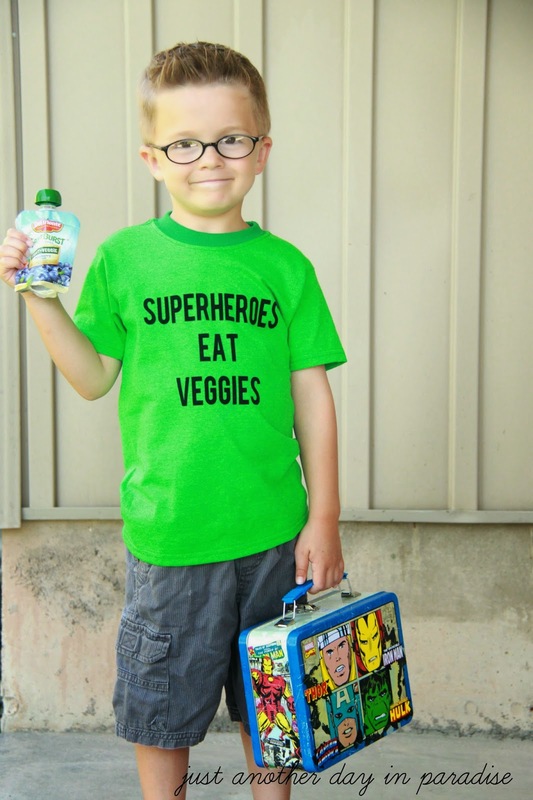 First, all you need to do is convince your picky eater that as a Superhero (or princess or ninja or whatever) they need their fruit and veggies. 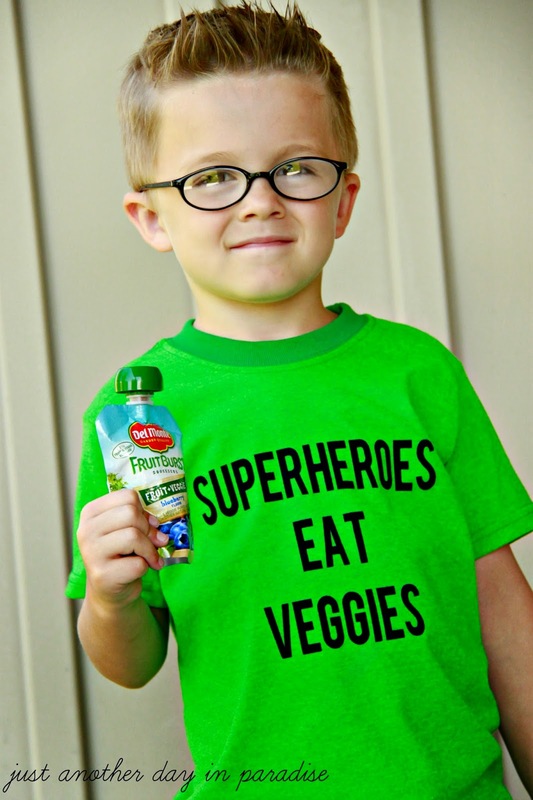 We are a bunch of superheroes around this house, so I opted to remind my super picky eater that Superheroes Eat Veggies. 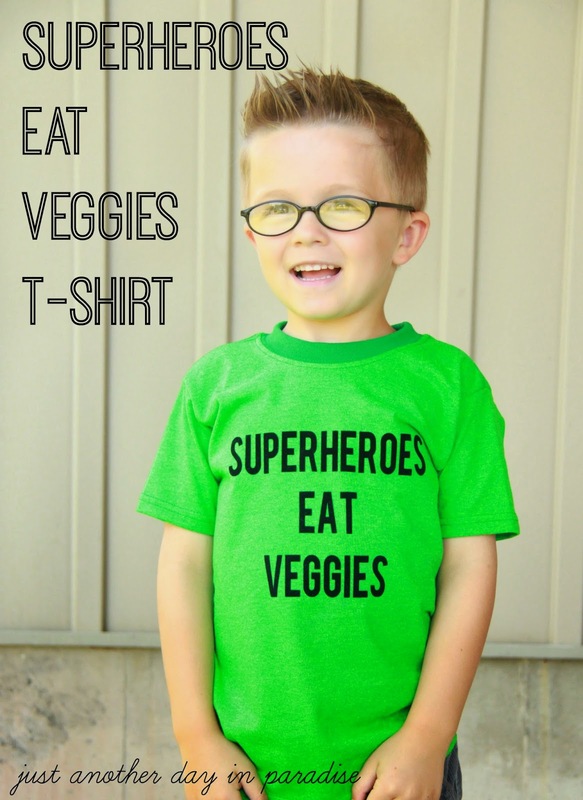 I decided my picky eater needed a t-shirt to help him remind him that as a superhero he needed to eat his veggies. 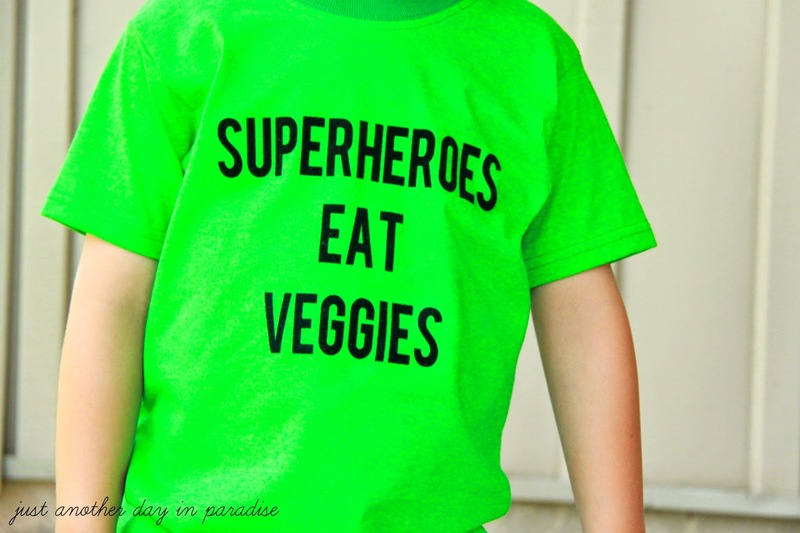 The Superheroes Eat Veggies T-shirt was born. He hasn't wanted to take off his this shirt since he put it on. Keep reading for details on how I made this shirt. 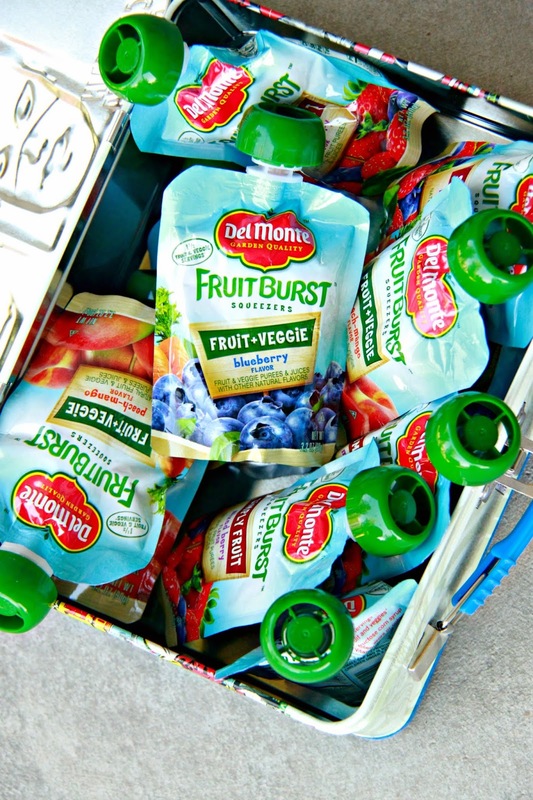 The next mommy brilliant solution are these Del Monte Fruit Burst Squeezers. They are brilliant. They have fruit squeezers and fruit and VEGGIE squeezers. Plus they are portable. Everyone knows as a Superhero you have be ready to go save the world on a moments notice. Superheroes also need to eat a lot. Not long after breakfast they need a snack. Just after lunch, they need a snack. Snacks, snacks, and more snacks. I have been struggling to avoid the typical snacks of crackers, chips, and junk food. These little pouches of fruit and veggie goodness have saved me. With so many yummy flavors, my Supers have lots of options so they are happy. I am happy because whether they are the Fruit Only Squeezers in strawberry and mixed berry or the Fruit and Veggie Squeezers in peach mango, blueberry, and apple cinnamon they are getting a healthy snack. They are packed with 1 1/2 servings of fruits and veggies. They are have a fruit-tastic taste that my Supers loved. They have no corn syrup which I loved. These have a variety of ways to use them. Not only are they great for an on-the go snack or the school lunch box, but they also are great for after game snacks. No matter how you serve them, your Supers will love them. For more ideas on how to encourage your kids to eat healthy visit this my Healthy Kid-Approved Snacks Pinterest Board. Add some garden to your Super's lunch box and the snack pantry with these Fruit Squeezers. Your Superhero will run faster and fly higher. 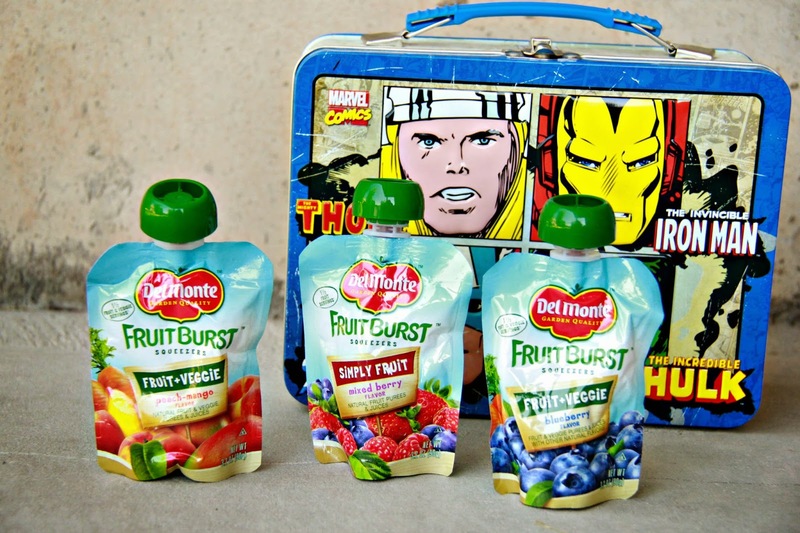 Run faster than a speeding bullet to your local grocery store and grab up some of these Del Monte Fruit Squeezers. Del Monte offers good for you fruit goodness in plastic cups. Again, any way you serve it, they are gonna love it. Once you have your favorite Del Monte snack in your pantry, snap a photo of your Super enjoying their snack and head on over to Del Monte's Facebook Page and enter Back To School Contest: Do you Squeeze or Spoon? All you have to do is upload your photo and vote on your favorites. 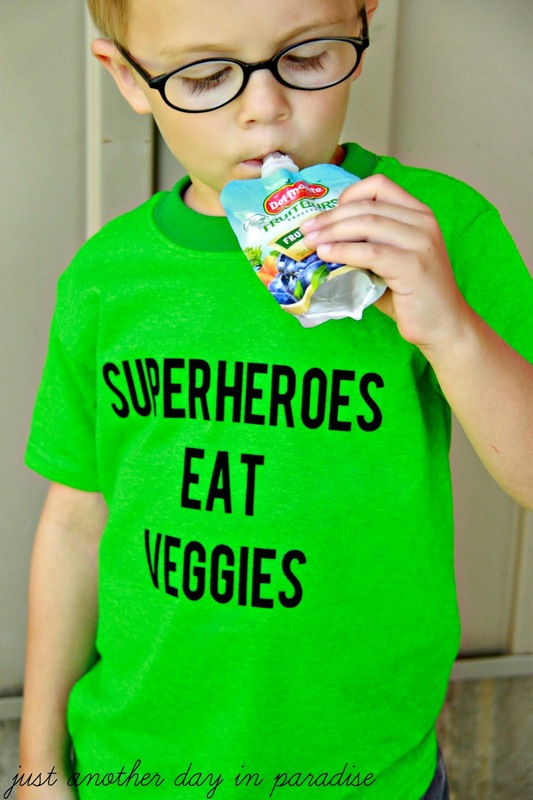 How cute would your photo be if your Super was sporting this Superheroes Eat Veggies T-shirt while they were enjoying their favorite Del Monte snack? You could change the wording to Princesses Eat Veggies or Superheroes Eat Fruit And Veggies or anything else. You need a t-shirt, heat transfer vinyl, vinyl cutting software. The font I used was Bebas. Type up the phrase you want and flip it horizontally, cut it out on your vinyl cutter, and iron on to your t-shirt. If you don't have a vinyl cutter you can also trace the phrase onto freezer paper, cut out to make a stencil, and use fabric paint to paint on the words to the shirt. Any way you make it, your kiddo will look adorable. So let me know, do your kids prefer to Squeeze or Spoon? My Supers can't decide what they like to do best because they love it all. Let me know in the comments if your kids prefer to Squeeze or Spoon and you will be entered to win $100 Visa Gift Card. Eek! So exciting. Who couldn't use a $100? Also don't forget to go and visit Del Monte on Facebook and enter their Back To School Contest. If you share a photo of your kiddos' favorite Del Monte Squeeze or Spoon snack on their page between August 1st and September 1st you could win one of two $10,000 grand prizes for your kids' school. This sweepstakes runs from 8/1-9/19. Be sure to visit the Del Monte Brand Page on BlogHer.com where you can read other bloggers’ posts! I bought these for the first time this summer while we were camping, I love the peach mango-it is so delicious! I think it is funny that my boys will snarf down these squeezie snacks but refuse to eat applesauce out of a bowl. Squeezies for us! My kids are happy to eat out of the pouch or with a spoon. At home, they definitely use a spoon, but out- the pouch keeps them clean. My kids prefer to spoon. My kids prefer to squeeze. Suckers! We love these at our house! My kids like squeezing over spoons. My daughter loves to spoon which helps develop her eye-hand coordination :) Although squeezing may be less messy. I tweeted about the giveaway under username @yarbr012 : https://twitter.com/yarbr012/status/495372874543562753. I like to spoon ans my kids; Well one kid likes to spoon and the other kid like to squeeze! My little girl is definitely a squeezer! :) Love that she enjoys her fruit! My children like both but prefer to squeeze. Squeeze, right! Why dirty a spoon? :) We love all the fruit veggie combos! Great for school lunches. My kids love to squeeze! Sometimes my kids prefer to squeeze and sometimes they prefer to spoon. My child prefers to squeeze—no bothering with utensils. My daughter likes the squeeze pouches, but my son like the fruit chunks. Last school year my daughter enjoyed the peach fruit cups a lot and we haven't tried these yet so we'll have to :-) I bet she will love the squeeze ones and hopefully my picky son will try one too. I have never tried the squeezers so we use spoons. My kids love to squeeze. We do both, but mostly spoon..thanks so much! We definitely prefer to spoon. what a cute shirt and idea! My son would prefer to spoon it. I usually don't give mine a choice. It's a spoon for us. We squeeze, it's a lot easier. My 4 year old daughter enjoys to spoon and squeeze! But if she had to choose just one way she would probably go with SQUEEZE! :) I myself would have to go with spoon though. My kids like to squeeze, and I like that they are easy to take in the car. The squeeze ones are so much more convenient! My nieces prefer to squeeze. My daughter prefers to squeeze! Thanks for the opportunity to win! They are easy to make on your own. My kids love homemade and loved to just help. We do both…but squeezing is so much easier and convenient especially on the go! I am a spooner but the grandbabies are squeezers. My grandkids prefer to squeeze as they are always on the go to school, athletics, band and various other activities they participate in. The squeeze method is so much easier. Plastic: bad for your kid, bad for the environment. 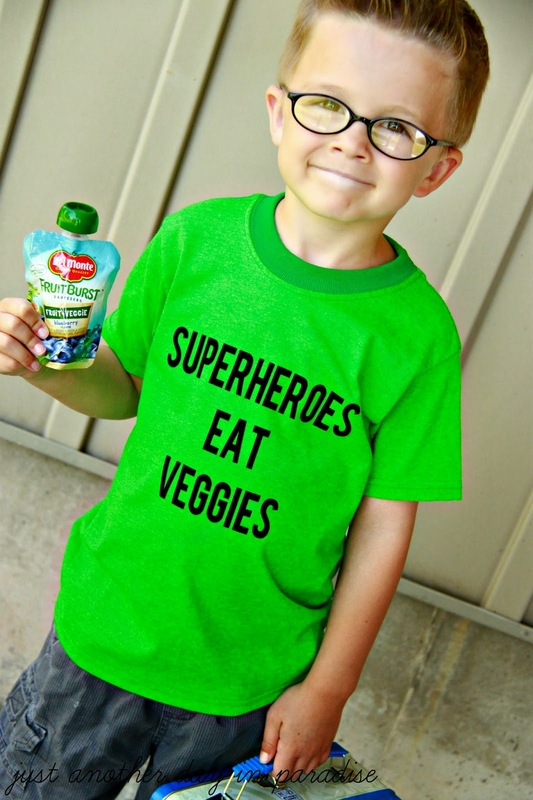 Be a planetary hero and supermom -- make your own fruit- veggie blends! 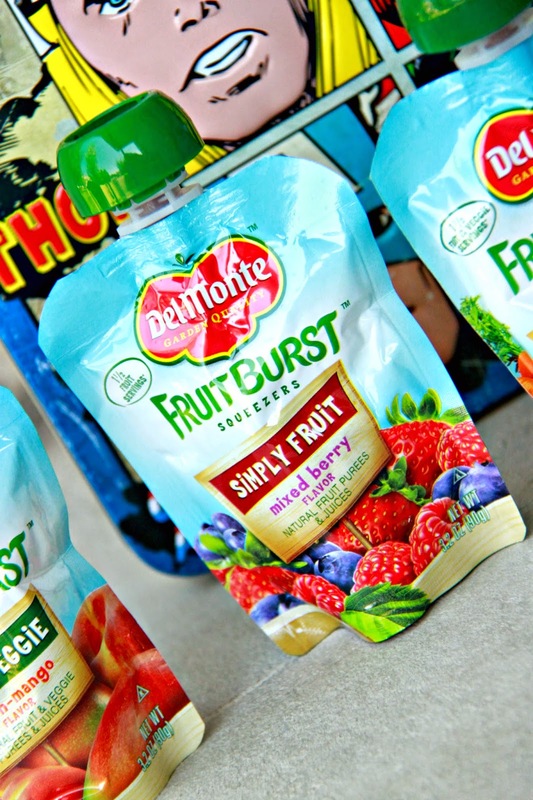 We love the Del Monte Fruit squeeze at our house and we love the squeeze snacks! My kids prefer to squeeze. My son is a squeezer! My kids prefer the squeeze, but I prefer the spoon myself. Thanks so much for the opportunity to enter. The kids are so squeeze - thank you. They prefer to use a spoon. My kids like to squeeze. my niece & nephew would prefer to squeeze! My hubby and I do not have any kids, but we do eat stuff like this ourselves. We both like it out of a large glass container and then into a smaller glass container and eaten with a spoon. Love the t-shirt! My daughter would prefer to squeeze. The grandkids like the novelty of squeezing and they like being able to carry their snack along instead of being stuck at a table.